Plum chutney warms gently on the stove at Danielle Coombes’ home in Ashley Down. Having worked in the food industry for more 20 years, she looks completely at home with her apron on. She shows Sara Venn and I that the fridge is full of peeled shallots, ready to be picked, and pomegranate juice, to be turned into cordial: evidence of a busy afternoon of prep. The strong, vinegary smell of chutney permeates the air. Sara – of Incredible Edible Bristol, aiming to fill Bristol with edible plants – is put to work peeling a box of apples that were delivered earlier today. 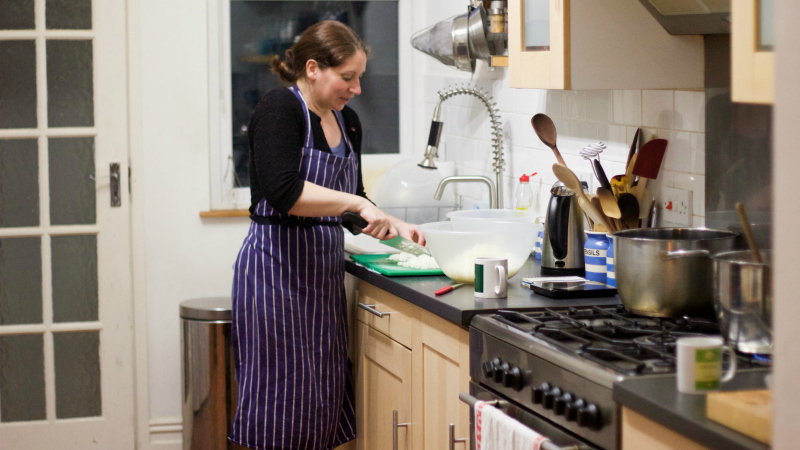 As Danielle skilfully dices an onion, she explains how Bristol Jam Plan formed. FoodCycle volunteers collect food that would otherwise be thrown away, and distribute it to vulnerable people via charities, including homeless shelters. Bristol Jam Plan’s creations depends on the produce donated, but favourites so far include beetroot chutney, banana ketchup and lime marmalade. Once the preserves are finished, they are either donated directly to local charities, or sold in shops or at markets. The money is donated back to FoodCycle to continue the process. Sara tips the apples into an enormous stainless steel pot and they begin to simmer away on the stove, more scent rising into the warm air of the kitchen while the rain beats down outside.